This brief DVD uses an engaging song to sensitize us to a day in the life of a person with dementia. Through Mr. Memories, we learn that, although he may struggle daily to remember important details, he is still very much alive in the present. He may not be avle to find his shoes, but he knows that he wants to feel needed and important; he may not remember everything he did that day, but he still wakes up with a desire to do something meaningful. Memories of his past – a wife, children, and personal passions are still in his head – and can be encouraged through photographs, visits from loved ones, and social interactions with those around him. 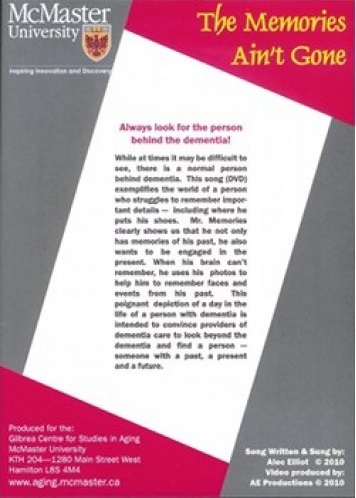 The DVD effectively reminds us to respond to the person behind the dementia as a person who has a past, a present, and, most importantly, a future. Ideal for staff training, families, volunteers, conferences, and anyone who works with or will work with older adults.